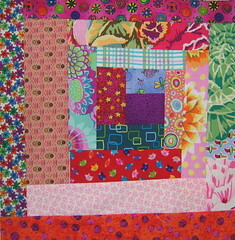 First today I need to post a picture of this quilt block that arrived yesterday. It is from the Quilt Block Exchange and came from Isaacsmama. 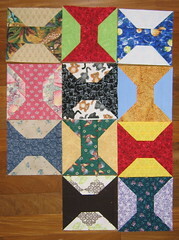 This morning I got busy right away and finished off these spool blocks for the group quilt. I would have had 12 but I miscut one block so it ended up 6" X 6.5" instead of 6.5" square. Oh well, it has been added to my orphan block pile and will be used someday for something! When I was putting the spool blocks together I ran a second row of stitching as I did the angles so I ended up with lots of little half square triangles that I put together into broken dishes blocks. I have been doing this for several months and now have lots of little broken dishes blocks of various sizes. 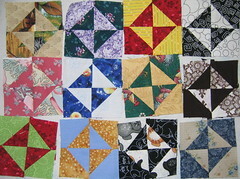 When I have enough I will put them all together into a quilt top. I need to mention that I got all those blocks done before 9:30 AM! Now I am going to head outside to get some plants potted for on the deck and elsewhere in the yard and then maybe some weeding or mowing, depending on whether the sun comes out or not!